Hey everyone! We have another progress update for you. This week, we've updated the Code on Standard Library UI to be a little more explicit and friendly for developing and shipping APIs. Special thanks to the team at Stripe who helped by specifically requesting some of the features. Before I get to the updates, I wanted to give a special shoutout to UofTHacks VI, University of Toronto's student Hackathon. Over 500 students showed up for 36 hours of hacking and we were happy to be able to help 20 teams in their quest to build the best hack. The team that walked away with five Nintendo Switch consoles for best use of Standard Library was Sharescription, a product that allows you to manage your shared house's subscriptions by splitting and collecting payments and then generating a virtual credit card to pay each provider (Netflix, etc.). Fantastic work! First we've changed the buttons on the bottom of the Code on Standard Library web interface to be a little more clear. We've added subtitles that explicitly describe what each button does, and we've renamed Publish to Up (deploys your API) to more closely map to our command line tools. Next, the functionality of the Up (previously Publish) button has changed. It used to publish an immutable, versioned API immediately. 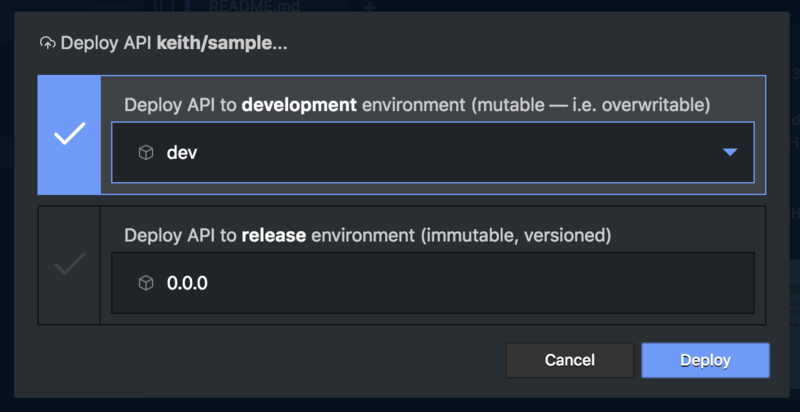 We've now changed it to allow you to specify which mutable environment or immutable release version target you'd like to deploy to. Note that for free accounts, only the dev mutable development environment can be deployed to. Versioned deployments (releases) follow semver rules. Finally, when deploying APIs with Code on Standard Library from this flow, you'll be given an immediate link to both your API documentation and the root endpoint on the API itself (mapping to functions/__main__.js). That's it for the UI updates this week. You can play with this functionality by visiting code.stdlib.com directly, or we've embedded it for you below. Please note that the Run functionality will automatically deploy (if necessary) and execute the code you've written, allowing for continuous integration from the browser. As an often overlooked feature, you can also change execution parameters on the left of the Debug screen instead of using something like the Postman web application to manage HTTP requests. Cheers! As usual, thanks for the entire Standard Library team! We hope you enjoy. We invite you to join our Slack workspace if you'd like to chat with the community. You can also follow us on Twitter, @StdLibHQ.